Carrozzeria Balbo was established in 1914 in Torino and began building cars, spider, coupes, sedan and light commercial bodies mostly derived from Fiat chassis. 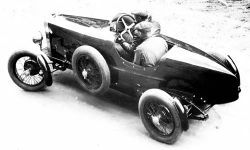 Alfonso Balbo set up a coachbuilding firm as early as 1914 and after World War II it applied itself in a rather different direction with a microcar prototype. Among the best of the former was a 2-door saloon on the Lancia Trikappa in 1922. He died suddendly in 1926 and the business was carried on by his closest business partner, Carlo Follis. Few car bodies were made until after World War II, when a cabriolet was built on a Fiat 1100, followed by a series of attractive saloons and coupes based on the Fiat 1100, Fiat 1400 and Fiat 1500. Some of these were 4-door saloons, unusual at a time when most Italian coachbuilders favoured coupes and cabriolets. The Balbo B400 was presented at the 1953 Turin Motor Show as a small 2 seater roll-top coupe. Its 398cc 14.9bhp 2 stroke twin cylinder engine was rear-mounted in unit with the gearbox and differential. A prominent styling feature was an American-style chrome 'jet-intake' ornament on the nose. It did nothing the Fiat Topolino was not already doing, and never passed the prototype stage.